A Confessor of the First Order, Saint Francis Mary was born in 1804 and died in 1866. His whole life bore witness to that aspect of our life in Christ that realizes it is more blessed to give than to receive. He began his life as a shepherd in the tiny village of Camporosso, near San Remo, from which occupation he gladly contributed to the support of his family. 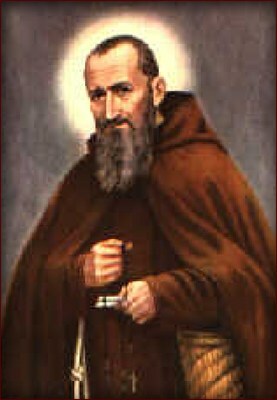 Having always been considerate of other's needs, he joined the Capuchins of the Genoa province and stated, "I came to the convent to be its beast of burden." This ideal which he was readily able to carry out when he was subsequently appointed as infirmarian and also called upon to go questing. He was neither afraid nor ashamed to call at the palaces of nobles; neither did he hesitate from distributing the alms he had received among the poor of the village. Although he was frequently heckled and assaulted, he continued to go questing in the unfavorable quarters of the seaport, where he would pick up the stones thrown at him and kiss them. Such a man soon had all these people fascinated, especially when talk began concerning miracles, cures and conversions, which reportedly Francis Mary was working. As his fame began to spread, people of all classes were pestering him night and day for advice on every conceivable topic. His personal austerity and observance of poverty made him a well beloved member of his fraternity and, as with the greater majority of Capuchins down through the years; he had a most touching love for Mary our Mother. It was not unusual for him to spend the whole night on his keens adoring Jesus in the Blessed Sacrament. With bread, advice, and a sympathetic ear, Francis Mary was ever ready to minister to the sufferings and the needs of all whom Jesus led to him. This life of self-sacrifice he was to crown in 1866, with the onset of an epidemic, which promised to reap a devastating harvest of pain and death, seized with the desire to make one last magnanimous sacrifice for the Virgin Mary, offering through her hands, his own life to God as a victim of expiation. Our Mother must have heard his request, for on September 17, 1866, he departed this life as a victim, and the epidemic ceased that very day. Francis Mary of Camporosso was subsequently beatified by Pope Pius XI; and canonized by Pope John XXIII, on December 9, 1962.